ERE is a privately held Ontario corporation, situated just outside of Toronto, Canada, and has been operating since 2000. Our growing team of CISSP and B.A.SC. engineering staff are security experts. Several of the key members have been working together since 1989, when they started a network and security technology sales organization. 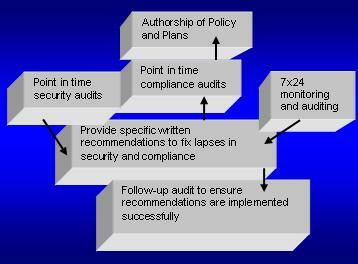 ERE was created in 2000 to focus on vendor neutral, totally impartial security and compliance audits. All of our revenues are derived from audit services. So the company does not sell audit services at a discount in order to lever sales of hardware and software. The company is cash flow positive and relies on internal financing for growth. ERE has adopted a client-centric business model, which places us in a boutique market of providing highly flexible, client specific services. This model is successful because ERE has created structured processes with detailed methodologies for delivering both real time and point in time audits, along with security policy authoring. So only the details of content change for each client but the delivery model remain constant. ERE’s marketing strategy is similarly client-centric. Since the strongest business drivers for computer security auditing relate to compliance, privacy, and to minimizing liability, ERE has incorporated our clients’ needs to our business model. The majority of clients are large publicly listed corporations and their subsidiaries, electrical utilities, and legal firms, spanning Canada, USA, and Europe. Clients range from enterprise size of $500,000,000 + in revues with worldwide distributed networks to smaller utilities with 50,000 clients. ERE clients tend to do repeat business with us, so we have many client references available upon request.